My main is only about 32' long (2" pipe) to the drop and has a Gorton #1 at the drop. I also have a big 3" header but wondering if I have enough venting. I know you can never have enough the #2 ain't cheap. Boiler is likely 2x oversized. Thoughts? I had no main venting up to about a year or so ago. My one section of Main (2") is also about 32' long. On that one I put on 2 Gordon #2's. On my other section of Main which is 11' long, I have 2 Gordon #1's. As you stated, can never have enough venting and I had an expert out earlier this year (Joe S) who made me feel great as he agreed that what I put in is what he would have recommended as well. I would definitely go with at least the 1 Gordon #2 on that Main....if the wallet can take the hit, I would go with 2 like I have. That 32 ft main needs two Gorton #2s , especially given that the boiler that much over sized. And the 3" main, depending on how long it is, needs Gorton 2's as well. The rule of thumb is one Gorton #2 for every 20 ft. of 2" main. With a 3"main, we need to know how long it is to suggest the number of vents you need on that. Even when properly vented, with a boiler that is twice as large as needed, it is still going to short cycle. You really need to look at the possibility of putting a two stage gas valve on that boiler. It will still not down fire that much but , at least be closer in size. Thanks guys - the 3" is for the header, not the main. Only one main. So should tee off two #2s? Not sure if I will have space because of joists and other pipes. 3 Gorton #1 are pretty close to a single #2 if you have space issues. I am in the same boat. Costs a little more because of fittings, but it gets the job done. For my longest main I recently built this antler and added 4 Gorton #1's. Interesting - I like the antler. But I need two #2s, i definitely don't have room for six #1s! BUT it sounds like the consensus is that a single #2 is not enough. You read quite a lot that you can't have too much main venting. Yes you can. If the vents you add exceed the venting capacity of the tapping they're attached to you wasted your money. Adding vents is a case of diminishing returns. The 2nd vents never cuts off as much time as the first. Have you ever timed how long it takes for the existing vent to get hot? 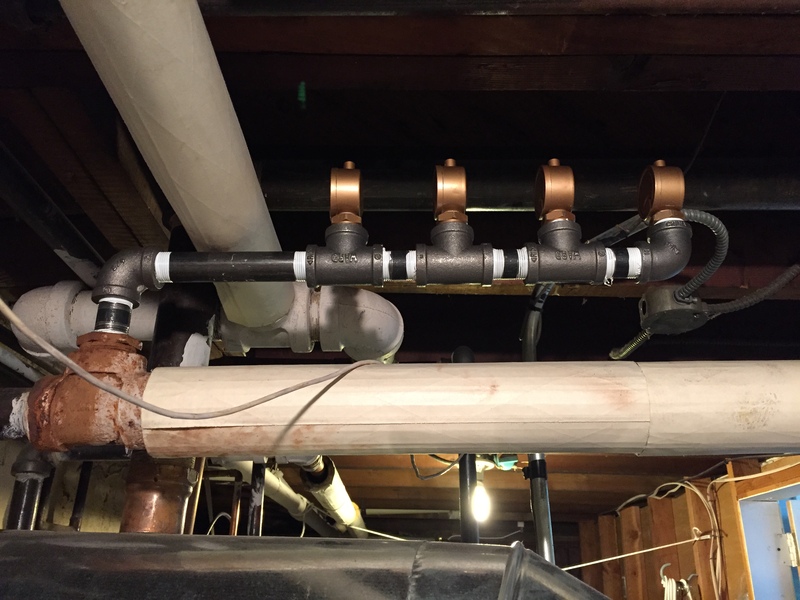 Have you ever done the open pipe venting test? What is the size of the existing tapping to the main? It's always best to control the variable of how hot the mains are. Stone cold pipe condense a lot of steam. Always let the boiler sit off a set amount of time in between tests. I use 1 hour. Run the boiler and heat the system up. Wait 1 hour and run the boiler and time how long it takes to get steam from the header to your vent. Write it down. Add one #2 with the existing vent wait the 1 hour and run the test again. Write it down. Let us know how long it takes. Then it will be up to you if adding another #2 will be worth the expense.